Give me a little suspense. A big dose of danger. Maybe even a murder and I’m glued to the page or the movie screen. I sometimes feel as if I need to join a support group called ID Anonymous and stand up in a room and admit I’m an ID addict. 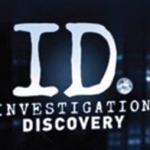 You see, I’m addicted to the ID channel. I can stay up until two in the morning watching Forty-Eight Hours and the Cold Case shows. I love sifting through the evidence and trying to figure out who did it and see how the bad guys are caught. Suspense has played a part in almost every book I’ve ever written. All young adult novels, that I write as C.C. Hunter, have suspense. All my Christie Craig books that I write have suspense. I just started a new series, Texas Justice, it’s an adult thriller and the first book, Don’t Close Your Eyes, is released today. Now this is not a young adult book, but for my older C.C. Hunter fans, you might want to pick it up. The ebook is on sale for only $2.99. Yes, you might call me a thrill seeker, an ambulance chaser, but I just like the safe thrills I get while turning pages, or writing pages. Remember the suspense woven through the Shadow Falls series? I loved watching Kylie solve the mysteries of the ghosts. And Della actually worked the crime cases while working for the FRU, the supernatural version of the FBI. Even Miranda’s story was about catching the bad guys. There was a crime in This Heart of Mine that was solved. One that put Matt and Leah in danger. And in The Mortician’s Daughter, there’s a new crime to solve in every book. 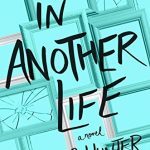 Writing that sense of danger, the unearthing of a crime, and outwitting a villain plays a big part in my new young adult thriller, In Another Life, that will release March 26, 2019. You can even preorder now at Amazon, Barnes & Noble, Books-A-Million, Indie Bound and Powells. Sept. 1st, I’ll be at Katy Budget Books with the incredibly talented Sharla Lovelace. I’ll be signing my new Christie Craig romantic suspense, Don’t Close Your Eyes, but I’ll also be signing my YAs The Mortician’s Daughter and This Heart of Mine. Sharla will be signing Charmed at First Sight, her new romance. We’ll be there from 3:00-5:00 PM. I hope you’ll join us. There will be loads of giveaways! 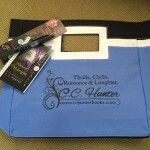 The winner of last week’s giveaway, another tote filled with swag is Sarita Blackmon. 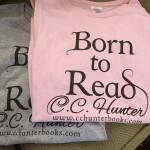 Sarita, send me an email at cc@cchunterbooks.com and give me your mailing address and I’ll send you your swag. We all like free stuff, right? We go to a conference or event and someone is giving away free promotional items, otherwise known as swag, and we love it. 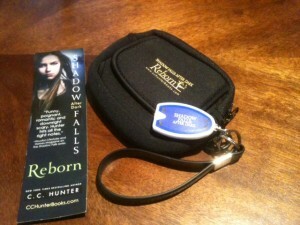 Or maybe you’ve entered one of my giveaways where I’m giving away swag for one of my books. Some things are more popular swag, like pens—who can’t use a pen? 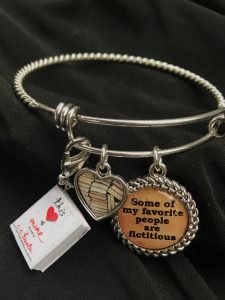 Some are more sought after like wine openers or tote bags. In the past I’ve done everything from slap bracelets to t-shirts. For my Christie Craig books I’ve done pizza cutters and even wine glasses. When I shop for swag, I look for something I think my fans would want to keep. Not just something with a title or my name on it. That’s why I like the little notepads with matching pens that you can drop in your purse. Another favorite of mine is a fingernail file. 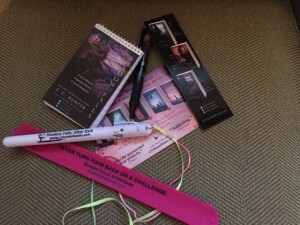 A lot of authors look at swag as a selling tool. Personally, I haven’t bought a book solely because of swag. Have you? I buy books for the author, or if someone recommends it. I personally see swag as sort of gift to my fans and my street team. Now it’s getting time to buy some more swag for my upcoming books. And I want to know what kind of swag do you prefer? If you get a T-shirt from an author, do you wear it? As fans of C.C. Hunter what would you like to get from me? This is just some of the swag I’ve given away. 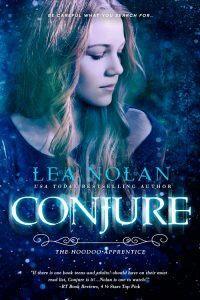 The winner of last week’s giveaway, an ebook of Lea Nolan’s Conjure is Katherine Bonine. Congratulations! You’re gonna LOVE this book. Please email me at cc@cchunterbooks.com and tell me if you prefer the Kindle or NOOK version. I’m so pleased to have Lea Nolan, author of the Hoodoo Apprentice series as my guest. The series is about Emma Guthrie, her twin brother Jack and their friend Cooper who discover a treasure and unwittingly unleash an ancient Gullah curse that attacks Jack and promises to steal Cooper’s soul. Emma has to learn hoodoo magic and risk her life to save her friends. I love, love love this series! Lea agreed to sit down with me and answer a few questions. In your Hoodoo Magic series your main character, Emma Guthrie, needs to learn hoodoo magic to save her friends. What exactly is hoodoo magic? I’m so glad you asked! Hoodoo is a uniquely American folk-magic primarily practiced in the southern US that is a blend of African-American, Native American, and European magic systems. It is most often associated with the Gullah people of the Sea Islands off the coasts of South Carolina and Georgia, but others practice it too. In hoodoo, practitioners use herbs and roots, along with some minerals and animal curios such as feathers, chicken bones, alligator paws and teeth for a variety of ends. A unique blend of Christianity, herbalism, and folk magic, Hoodoo can be used as a healing medicine but is also employed as a practical magic to protect against evil, bring love, draw money, assure personal success, or lay jinxes. Sometimes Hoodoo is confused with Voodoo. They couldn’t be more different. Voodoo is a religion that is predominantly practiced in the Caribbean, New Orleans, and “Santería” in Cuba. I spent a lot of time researching Hoodoo because I wanted to faithfully represent it and be respectful to its practitioners. All of the spells that appear in CONJURE and the other books in the series are based on authentic Hoodoo rootwork. If you’re interested in learning more, check out Hoodoo Herb and Root Magic: A Materia Magica of African-American Conjure byCatherine Yronwode and the Lucky Mojo Curio Company. You grew up on Long Island and now live in Maryland and say you love the water too much to live inland. You’re a girl after my own heart! What is it about the water that you find so appealing? Oh, I love the peace and tranquility I feel whenever I’m around or in water. It speaks to a deep place in my soul and helps to center me. I even enjoy watching the sea during a storm or just after one. The raw, churning power is truly awesome. And who can resist watching the sun rise or set over the water? Whenever I’m fortunate enough to see either of those, I’m filled with gratitude. Besides Young Adult, you also write contemporary romance. Do you favor one genre over another? Is it difficult for you to switch genres? I do write both and it’s honestly very difficult to pick a favorite. In many ways YA feels like my home genre. It’s what I first started writing and it brings me back to my own teens when I was a voracious reader. YA is great because you get to explore all the firsts—first kisses, hand holds, crushes, and sometimes heartbreaks. Also, there are fewer limits on what you can do in a book for teens. It’s acceptable to mash genres, like romance, paranormal, and suspense elements, while also tackling tough coming-of-age issues. On the other hand, contemporary romance is great because I get to focus on grown-up characters with grown-up problems who are looking for the one person in the world who will make them whole and give them their happily ever after. The hardest thing about switching between genres is the tense change. For YA I write in first person/present tense; but I write contemporary romance in third person/past tense. Sometimes it’s hard to change gears. I love being with my family especially since my kids are getting older and they’ll be leaving the nest before I know it. My oldest heads to college in a couple weeks and my middle child is already a junior in high school. If it wasn’t for my baby, who’s about to start middle school, I’d probably be losing it. I know we’re supposed to want our birdies to fly the nest and be successful on their own, but I confess I’m not ready for it! When I’m not with my husband or kids, I’m indulging my love of true crime stories either by watching shows like Cold Justice or anything on the ID Channel, or listening to my new favorite podcast, My Favorite Murder. I’m working on a new project that I’m really excited about. It’s a women’s fiction novel about three suburban best friends, each of whom has a deadly secret. You can buy Conjure, Allure and Illusion at Amazon, Barnes and Noble, Indie Bound and Goodreads. Most parents harbor a fear, the worst fear imaginable—their child goes missing. Whether it’s a teenager or a small child, it’s a parent’s worst nightmare. According to the National Center for Missing and Exploited Children, roughly 800,000 children are reported missing each year in the United States — that’s roughly 2,000 per day. And we’ve all heard the stories about the teen or child abducted and held prisoner for years until they escape one day. But most of these children that go missing are never found. Some are presumed dead and others, well they just don’t know. If you watch TV shows like Criminal Minds or CSI, you’d believe there are kidnappers randomly grabbing people off the streets, but actually only about 1 one hundredth of 1% of kidnappings are committed by strangers. Far more common are children who have run away, have gotten lost or injured, have been taken by a family member (usually in a custody dispute) or simply aren’t where they’re expected to be because of a miscommunication. 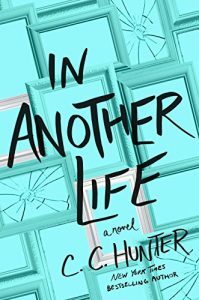 So, when I decided to write In Another Life, my YA coming out March 28, 2019, it started with an idea I’d had a while ago. What if you saw an age progression photo of a missing person, and it looked just like you? What if you also knew that you’d been adopted? What would you do? Would you think it must be you or would you blow it off as a coincidence? That’s the dilemma Chloe Holden is faced with in In Another Life. What does she do? Well, with the help of a cute guy, she looks into her adoption—and falls into danger. 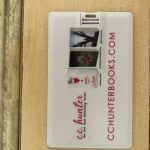 And since it’s a CC Hunter book, you know there is a happy ending, that Chloe survives to discover the truth. So at least her story has a happy ending—although there’s plenty of suspense getting there. You can pre-order In Another Life now at Amazon, Barnes & Noble, Books-A-Million, Indie Bound and Powells.